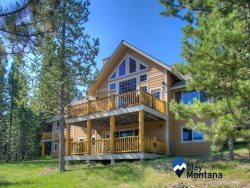 Hyalite View Ranch with private hot tub - New Listing! With Yellowstone National Park stretching for more than 3,500 square miles, the variety of restaurants available to tourists visiting the area is also vast. Enjoy visiting the little boutiques and pick yourself up a souvenir to remember your trip! Located just outside Yellowstone National Park, Gardiner is a quaint little town bursting of 136 years of history and is known as "Yellowstone`s Northern Gateway." West Yellowstone has a variety of dining options including family-run restaurants, cafes, pancake houses, coffee houses and bistros. Enjoy our regional specialties of trout, elk and bison or traditional Western cuisine. Be sure to top it off with a Montana huckleberry treat! The rustic history of West Yellowstone comes alive in many of our dining facilities.